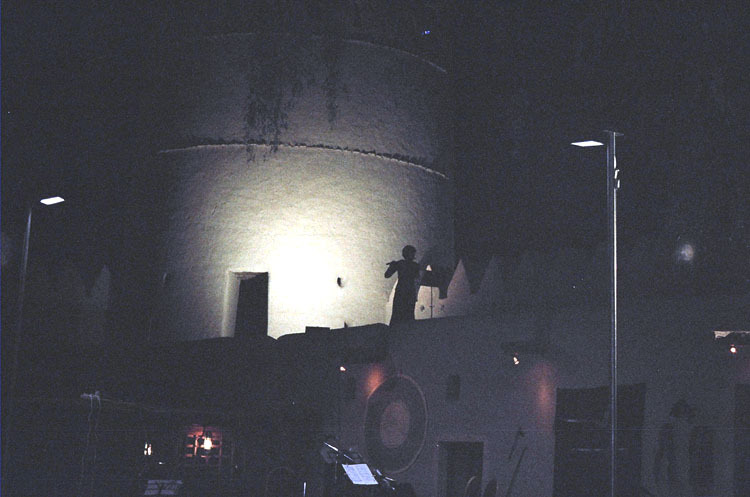 The flute player atop the wall, opening the show – so soulful! This year the Fifth Annual Al Ain Classical Music Festival was held at the Intercontinental Hotel on March 2, 3 & 4. The ENHG – Al Ain Chapter conducted natural history tours of interesting areas around Al Ain for the musicians, guests of the hotel and our own members. On both Thursday and Friday mornings, eight tours were offered. Thanks to a great volunteer effort, guests had a chance to visit some of those sites we find attractive. This is what the tour leaders had to report . Fossil Valley Tours: (W. Moore) We went out on Wednesday evening and placed a number of small mammal traps in the valley. Thursday morning we went out and released all the mammals after photographing them, so we were able to show those who came on the tour on either day some of the smaller inhabitants of the area. Five gerbil spp. 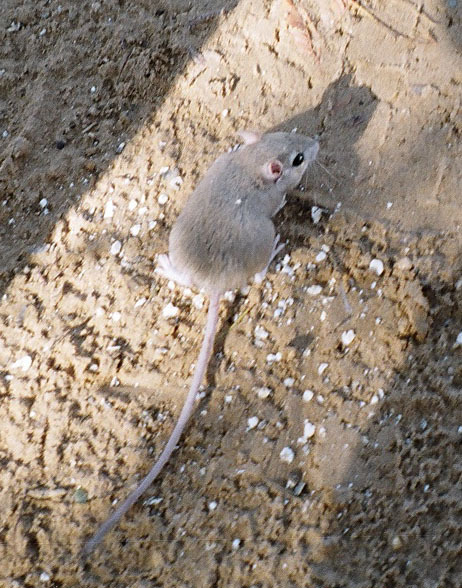 and two jird were caught, photographed, and released. Lots of interesting fossils were found. One, still embedded in the rock caught my able assistant’s eye. On Friday as we were homeward bound we stopped to photograph the desert hyacinth blossoming beside the road. There in the shoulder of the road beside my foot was what appeared to be a 4” long fossilized leaf.. It is currently being examined for identification purposes and will be turned in to the museum if it is indeed a new as yet unreported variety. O b s e r v e - R e c o r d - R E P O R T ! Khutwa Oasis: (B. Holmes) We offered two different types of trips to the popular oasis community of Khutwah. There were only a few interested in the Thursday morning trip, with a couple touring the oasis with Geoff to discover the various plants growing there, whether growing wild or under cultivation. Brien had a half a dozen for the inspection of some of the archaeological sites. 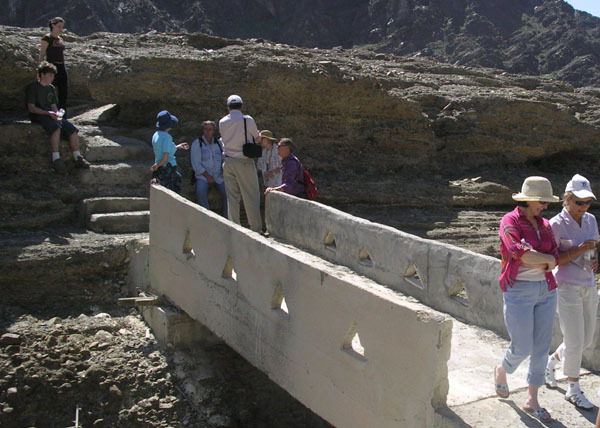 The Thursday group travelled back to the extensive terraces beyond Sultan's Oasis after inspecting the copper smelters and the donkey trail. On Friday, it was agreed that we would combine the two trips. There were more than 20 for the walk which began with an inspection of the oasis proper. We then moved on to the archaeology beyond the cultivated area. As in previous years, the most interesting remark was from those who had been to Khutwah on a number of occasions but admitted that they had never noticed the attractions that we were able to point out. For the guides as well as the visitors, the highlight of the weekend trips was definitely the sound and sight of water running through the Khutwah wadi. Even at the town square (where the solar clock has been relocated again!) visitors could hear the sound of water gushing through the gorge under the concrete bridge. number of locations. 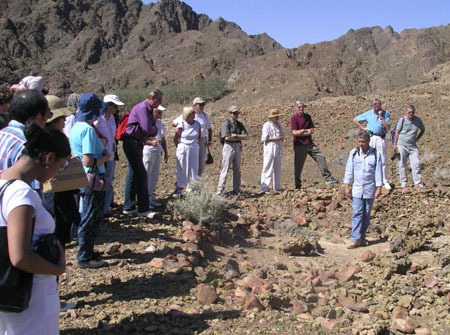 We observed the copper smelting pits and the Sharm-Nuway fallaj. Our time at the old village of Sharm was spent exploring the fort and village as we noted lush vegetation and insect life such as butterflies and dragon-flies. The Friday trip was more time constrained with the requirement of being back at the Intercontinental for the early afternoon concert. This meant, unfortun-ately, that we were unable to get to a number of sites near the end of the trip. We were seduced down one track by a herd of camels. It turned out to not con-nect with our usual track, but a good time was had by all exploring a new route and slightly more chal-lenging driving than the normal track. Hanging Gardens: (B. Jones) Thursday was a perfect day to visit the Hanging Gardens. After all the rain we'd had, the whole area was covered with plants in bloom. It had been many, many years since I'd seen everything looking so green and fresh. The bus left the hotel at 8:30am and we arrived at the start of the walk about 40 minutes later. The last small wadi crossing caused a few minutes’ delay as we had to do some "road building" so that the bus could cross without ripping off its rear fender. The group set off just after 9am and we slowly made our way to the gardens with frequent stops to look at the views, the flora and the remains of ancient houses and graves. We rested in the shade of the Hanging Gardens beside a large deep pool of water, listening to the sounds of the birds and the water dripping off the large slab of tufa. Reluctantly, we left this tranquil haven and made our way back to the bus, returning to the hotel in time for lunch. Friday was a repeat of the previous day except that the weather was a little warmer and we had to move a little quicker as there was an afternoon concert for the group to attend. I was surprised to find the water level in the pool at the Hanging Gardens had dropped almost a meter. After a short rest we returned to the bus and arrived at the hotel just after mid-day. Both groups said how much they had enjoyed the walk. They were amazed to find so many plants and birds at the gardens, some of them saying they would return to spend more time there as they felt there was something special about the place. A special thank you to my two "shepherds" Geraldine and Hoda who helped to make the trips a great success. 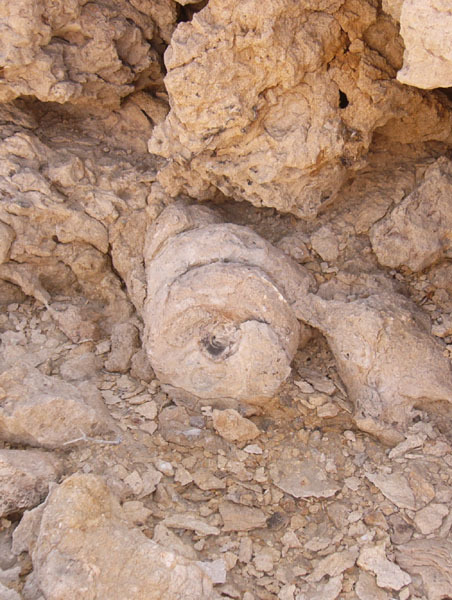 Aboul: (J. Buzzell) On Thursday and Friday small but enthusiastic groups explored Aboul oasis, wadi, and fort. Water levels were high and vegetation was lush, especially notable were the orchids. 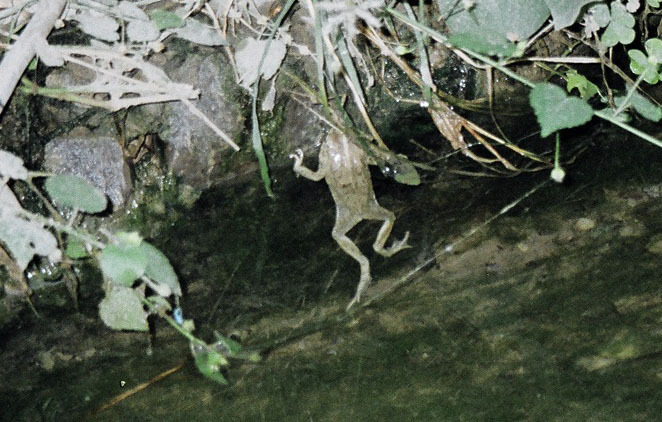 Geckos adorned the walls of the fort, toads paddled in the creek and the terraces of the old Aboul village were green with unplanted vegetation. 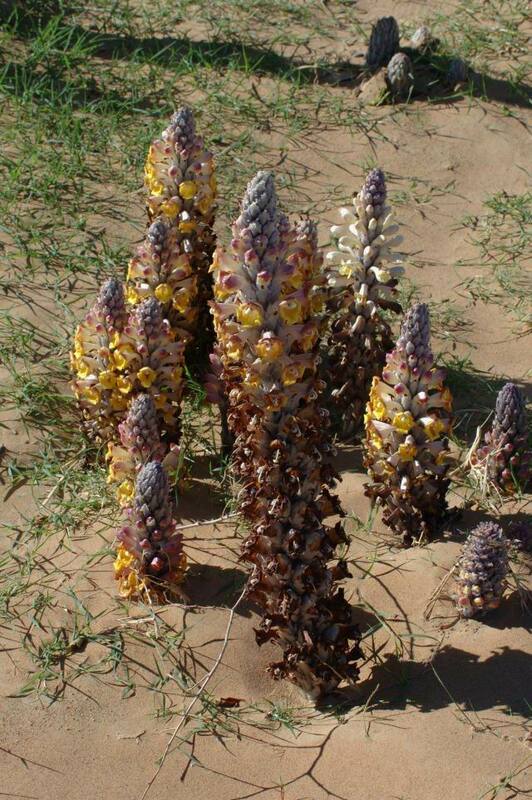 While returning to Al Ain, we stopped to view the desert hyacinth growing roadside near fossil valley. These are a parasitic plant that came with the small trees planted by the highway. They only bloom after good rains. And we have had a very good winter, with lots of rainy days. It was a sight some guests had never seen before. 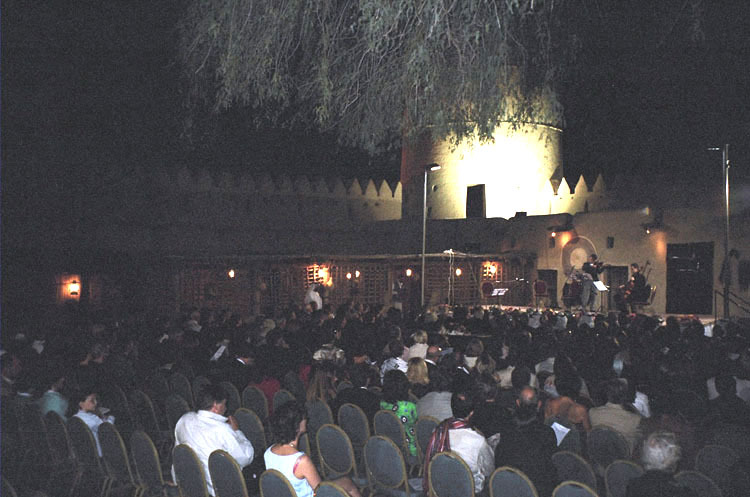 A’Dahir wadi, underground falaj and oasis: (B. Howarth) A'Dahir is one of our favourite sites for many reasons but the two most enjoyable features are the underground falaj and the bats that inhabit the falaj. Thus, on the Thursday we took a complete bus-load of folk (25 I think...) to the site, including ADCC folk and some of our members. Further ENHG members came along to help and grateful thanks go to Geoff, Mary and Angela. On arrival to the site we gave a little introduction to the site, pointing out the viewing shafts, oasis in the wadi, and some of the archaeology on the plane before climbing down into the wadi. Whilst Geoff, Angela and I took small groups into the 'underworld', Mary entertained folk by pointing out plants and using some of our library books to identify them. Amongst the wildlife observed were many bats, gecko eggs and a gecko. Aware of causing disturbance, we dealt with that matter by having small numbers in the falaj at any time and a maximum of 4 head torches in the group. 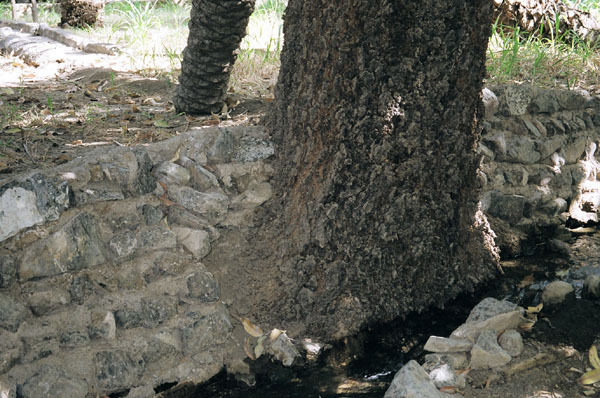 Once the visits to the underworld were over, we walked along the wadi, enjoying flowering plants and flowing water, together with the 'fern gully' along the wadi before heading out of the wadi and back to Al Ain. 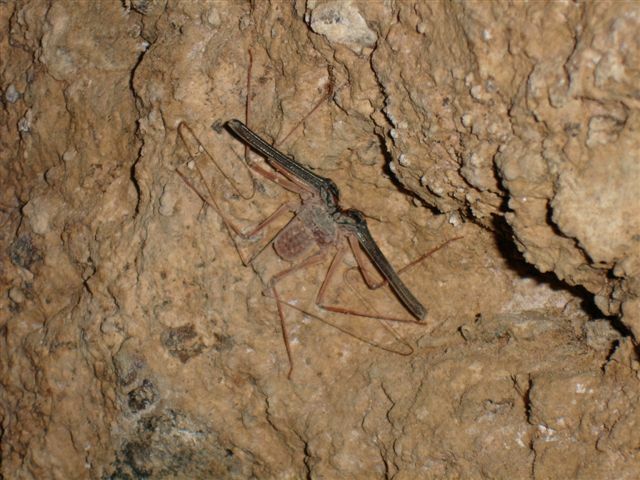 The Friday group consisted of just two individuals but both were thrilled and much to my horror we encountered an arthropod in the falaj that I have identified as a whip spider (see photo). These were altogether two most enjoyable days. All in all, the Music festival tours were a great success – thanks to the efforts of those who helped out and those who organized the events. Our “Thanks” go to the Abu Dhabi Concert Committee as well – I’m sure that whatever they have in store for us next year will be special. Mozart seems to be on the wind. our thanks to the Abu Dhabi Chapter for hosting the event this year! Last month we published the itinerary for the weekend event – this month some comments from one of our Al Ain members after attending the Advanced Sand Driving course - one of the many fine events of the weekend! Why drive in the desert? For the natural history group members, to get around and experience all the wonders of the desert environment. No dune bashers for this course, disciples of nature only are welcome. I attended the second day of the course, for “advanced drivers” – meaning anyone who had survived the first day or who felt they knew enough to cope with the second without benefit of the first. Of course, after the expert instruction of Brien and Gary in Al Ain – I must be ready for anything that Abu Dhabi could throw at me! The Abu Dhabi course was well taught, several experienced instructors gave theory intermittently between practical bits - with all comfortable on mats under a couple of shady gaff trees - beautiful dunes all around us, the curves and contours of the desert to enjoy. A man showed up zipping over the dunes on his camel. No takers for camel rides today though, all interest centered on motorized desert travel. Methinks I would like to ride a camel though, a lot more challenging to learn to move about and operate another living being than a mechanical beast with no brain. The first practical step of the second day involved some good runs down steep dunes and then up and over a couple more. Great fun observing the various personalities of the male and female drivers and their associated performances and difficulties and successes - tires were down to 18 psi or so, but one inexperienced driver found that going from 20 to 18 give him a boost in his weak performance on those hills. Step two was towing a car off the top of a dune, slow pull and jerk pull. Bing and off – mafi-mushkila! Then a circuit weaving up and down here and there through the dunes - I took a run through with another driver, nice guy, in a big macho Nissan patrol - first time round he had a problem getting up a steep bit - next run, on the approach for that same challenging bit, he took it too slow and didn't get up and over - much talk! The final step on the road to becoming a successful dune driver was pathfinding through the dunes, along, and up and down and here and there - all pretty good, except again interesting interaction of personalities and driving traits. Another guy in a big Nissan patrol got trapped in a bowl when he couldn't get up and over the top – near disaster! - instead of getting out to warn the next driver, he started backing up to get momentum - another vehicle coming over the top at that point just managed to stop in time, getting hung up on top of the dune - could have been a bad crash - first driver then raced back and forth, up and down, around, in a panic, sand flying everywhere - no luck - an old hippie style instructor then stepped into the sand blower's car, took the wheel, and made a slow turn around the bowl and up and over, no sweat! - then took his own vehicle backwards up the first hill to do a jerk pull to free the other guy. – Moral? ‘Slow but sure,” comes to mind. According to chief instructor Alan McGee's good instruction guide for the course, often the most hazardous move for the vehicle is coming over a small dune. These dunes look deceptively easy. If you do it too fast, and there is hard material at bottom, you can smash the front end of your vehicle because there’s no sand on the descent to slow you down before bottoming out. During the Abu Dhabi course we saw big vehicles getting stuck on small dunes on the way over, and having to be jerked off -- the reverse problem, a bit too slow. Overall, the course was carefully run, respectful of desert environment and safety of participants - and it was a lovely desert day to boot. Desert driving psychology could be an interesting research speciality. After the misadventure in the mountains last month, the committee spent several meetings coming up with a list of recommendations relating to more adventurous outings. Here is the product of those meetings. 1. That the chapter purchase a Thurraya or satellite telephone. One telephone would be sufficient to send out messages and to transmit GPS coordinates. 3. That each weekend one individual from ENHG be assigned as the contact person; the contact person would be advised of the number of vehicles and individuals heading out on any weekend field trip. 4. That the contact person be prepared to initiate a plan of action should the group not return by a designated time. 5. That trips be described in as much detail as possible. 6. That the trip leader be prepared to discourage unsuitable individuals from participating, if necessary, OR modify the trip to accommodate the individuals who do show up. 7. That the group differentiate between reconnaissance trips and regular field trips; that reconnaissance trips be ‘by invitation only’ and the appropriate precautions taken. 9. That phone access, even with a satellite telephone, be considered before any field trip proceeds. 10. That the convoy list be filled out before each field trip and that it be left in a vehicle to be recovered, if necessary, later by those trying to assist. My boots are made for walkin' How about yours? You have probably thought that I have given up on the Triple Crescent hikes. Not true, other commitments have prevented me from getting out and about. Hopefully that has now all changed . So I'm going hiking this Thursday 7th April. As it is the first walk after a long rest I will do something easy, maybe Jebel Qatara or Jebel Abayal. If there are people wanting to attempt the Triple crescent walks then it will be J. Abayal. If you would like to join me send me an e-mail before Wednesday 2pm so I know numbers. The weather is getting warmer so carry plenty (4litres minimum) of water and have good sun protection. Please don't come if you do not have good strong walking boots. These hikes are not easy on the feet/ankles/knees. Plan on walking for 4-6 hours, if it's J. Qatara it will probably be 6-8 hours. binoculars, sunscreen, personal 1st aid kit. Bring more water/juice to be kept in the vehicle for when you return. I will try to remember to bring a cool-box for those of you who prefer cool drinks. 1. Geoff Sanderson has moved to Dubai and as such felt he should step down as our Vice-chair person. Gerald Buzzell has taken on this responsibility – thank you Geoff and Jerry! 2. Chris Sanor has stepped down as our Maintenance person as he felt the taxi fare from the USA would place an onerous debt on him when he came to change the light-bulbs – Denise Caporali-Lee has taken on this task – our thanks to you, Chris and Denise. 3. The months of February and March have been declared extended months as there is just too much activity going on to fit it all into a regular month, so next year these two months will have 45 days each so we can do the things we do at a more leisurely pace. 4. And last but not least, my apologies for not getting write-ups of all the weekly outings this past month - won’t let it happen again. – you could send me a small write-up just to be sure! This is a great time to join the committee – what? – why, you ask? – because there’s just time enough left to get a taste of it before the season ends – if you don’t like it, you can quietly slip away during the summer break! So come on down to your display room on the third Tuesday of the month and join us in doing what we do – then take the leap and sit in – you don’t have to be elected – on a committee meeting on the first Tuesday of May – 7:30 pm is our usual gathering time, though sometimes it takes us a few minutes to find the place! – Where is it? – at the town center end of the Al Ain English Speaking School on Schools road – take the second exit to the right as you drive from Abu Dhabi toward town after the Airport Road roundabout on Schools road.